Mark your calendar! Master Gardeners will be in the garden midweek on Wednesday, October 10 from 9am to Noon for our final 2018 Open Garden event. Come talk to us about planting bulbs, water-efficient lawn conversions, dividing perennials, succulents and more. October is a lovely time to visit the garden. The low growing delicate white zephyr lilies have burst into bloom along the entrance walkways. Our native plants are waking up from their summer dormancy. The buckwheat, currant, Douglas iris and ceanothus etc., are sprouting fresh new growth. 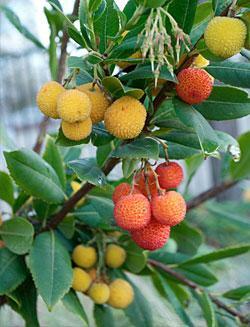 Guava, dwarf pomegranate, and dwarf strawberry tree (Arbutus unedo ‘Compacta’) fruits are ripening. 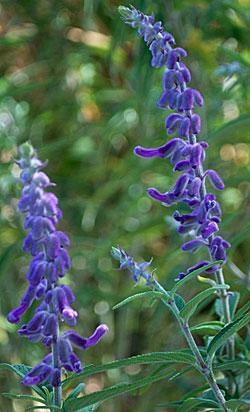 Purple Mexican sage and red autumn sage flowers sharply accent the ripening, drying grasses. 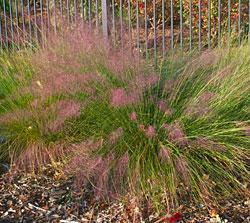 Frothy pink muhlygrass stalks glimmer in the parking lot bed. 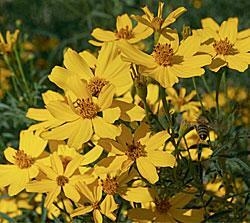 Shorter days have also triggered the daisy-like blooms covering the pungent yellow marigold shrub, copper canyon daisy. 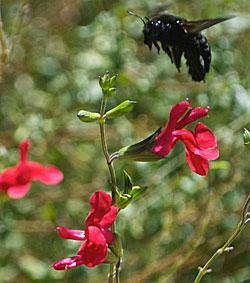 Bees continue to flit about the garden sampling late blooms. Scrub jays are happily planting acorns. Many deciduous shrubs and trees are turning lovely golden, scarlet and amber hues. Especially attractive are the Chinese pistache, burning bush, scarlet oak, trident maple and crape myrtles. Fall is planting season in the Sacramento area. The pleasant fall weather allows roots to establish ahead of the rainy season. We will be replacing, removing, dividing and renovating areas of our garden throughout the month. Tasks include dividing overcrowded bulbs and perennials (especially our Peruvian scilla, daylillies, penstemons, and black eyed susans), deadheading late blooming salvias, cleaning out our dry river bed, and pulling late season weeds such as perennial spurge and pokeweed. 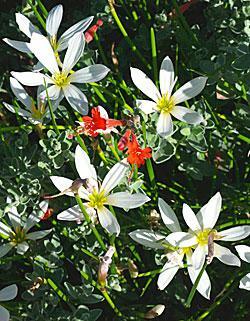 For help identifying weeds check out the UC IPM online Weed Gallery. Garden chores in October also include the time to continue to monitor for pests. Since pests tend to be specific to a plant it is important to identify the pest before determining a management plan. In many cases spraying a pest off the plant with water, picking it off and dropping it in a pail of sudsy water or deciding to live with the small amount of damage is the correct course of action. Often, the good bugs and birds are able to control minor infestations. In past years we have had our redbuds suffer damage by the redhumped caterpillar, Schizura concinna, which skeletonizes the outer leaves. 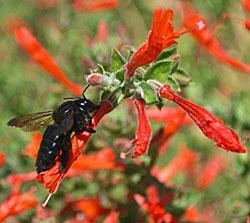 It has been controlled in our garden by parasitic wasps that use the caterpillar as a host for their eggs. (A good resource for flower pest management and cultural care is the UC Integrated Pest Management website on flowers and for woody-plant leaf caterpillars is Leaf-feeding caterpillars on woody plants). Come check out the garden. 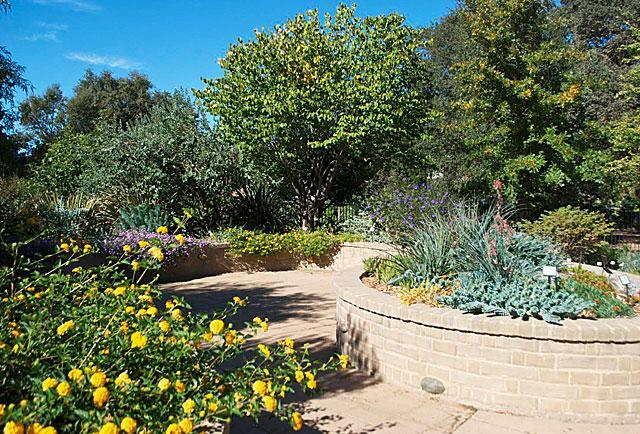 In addition to the plants, pathways, patios, raised planters, drip irrigation, a dry creek bed and permeable pavement demonstrate water wise, sustainable alternatives for gardeners who are considering replacing or reducing their lawns. 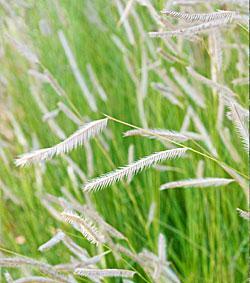 See Lawn Removal Methods for help with the first step.